In this video, learn about working on a factory trawler. Most factory trawlers fish for pollock during the allocated seasons. If they want to operate more, they may fish for grouper or Pacific whiting in waters further south. In the off-season, factory trawlers may head to Russia, Oregon, or Australia. How Does A Factory Trawler Work? On factory trawlers, most things are fully automated, but man power is still needed. Deckhands set up drag nets, called trawls that vary in size. These trawls are dragged behind the boat and catch anything in their path. When the net is pulled in, the fish are gathered in the cod end – a section the size of a massive train car. The cod end can hold 5 to 150 tons of fish each time it is pulled in and this happens every few hours. The fish are dumped on deck and dropped down the hatch. Below deck is an entire processing factory full of hard workers. The fish are sorted, processed, and frozen – all before the next cod end is pulled in. This is done non-stop until the freezers are full. Once the boat is at capacity, it heads to port to offload the fish – a process that can take several days. After a full re-supply, the factory trawler heads back. Depending on your job, experience, skills, and licenses you will make between $2,000 and $7,000 per month. That’s working 12 to 16 hour days, but the boat is your life. You’ll eat, work, and sleep – don’t plan on doing much else, but you also don’t spend much of the money you earn. 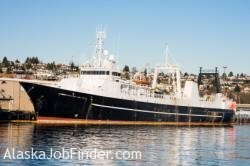 With 60+ trawlers working in Alaska and each one employing about 140 people, you’ll be able to find a job in this lucrative all-in-one niche. 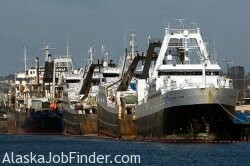 In the Members Section of AlaskaJobFinder we provide you some proven tips and strategies for landing the best factory trawler jobs. We also have detailed hiring information for each of the companies. Use AlaskaJobFinder to help your find a great job in Alaska. There are hundreds of open jobs right now. Simply click the button below to start your job search.